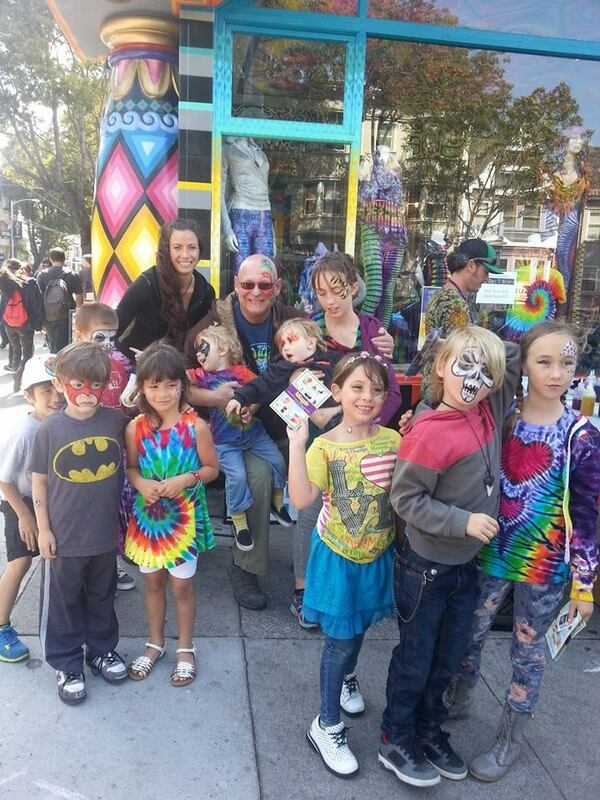 I was invited to face paint at Jammin on Haight, a tie-dye apparel store located on Haight street in San Francisco. They were having a special event for Youth Celebration day that was free and open for any passerby’s! For only $20, anyone could pick out their size t-shirt and the professional tie-dye artists (from Jammin on Haight) would help teach and show them how to tie-dye it. Jammin on Haight provided free hot dogs, ice cream, candy, bubbles and the kids were able to chalk up the sidewalks and hang out as long as they wanted. I had a blast painting all of the adorable little kids and I even got to paint a few adult faces! I painted one particular family with 2 adults and 2 children that all wanted butterflies. The children stopped first and begged their parents to get painted and after leaving for ice cream, the parents came back and decided they wanted to get painted too! 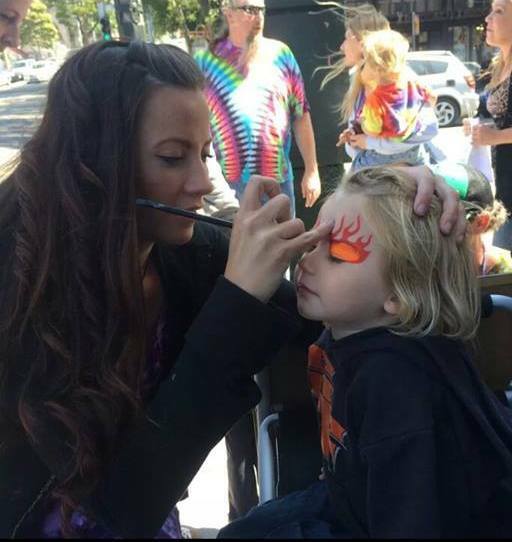 One of the little boys that wanted to be face painted, was so excited about the flame eyes that I have on my face painting display board. Even though his Mom was trying to get him to be a tiger, he had his heart set on flame eyes! It was so cute because he is normally a very hyper-active child and his Mom could not believe that he sat perfectly still for me to paint his face! She commented that she should take him to have his face painted more often! So as if that wasn’t fun enough, this little guy was so excited when he looked in the mirror and saw the flames painted above both eyes that he immediately started pretending that he now had the superpower to throw fire from his hands! The rest of the day, he continued to pretend he was throwing fire and it made a few other little boys get the same design so they could be flame boys too. It was one of those moments that remind me why I love face painting so much! It brings so much joy! I LOVE the Jammin on Haight Store which is located on Haight Street in the Haight-Ashbury District of San Francisco. They sell mostly tie-dye clothing, apparel and accessories that are all one of a kind and hand made by talented artists right in San Francisco. If you are not near San Francisco, you can always shop on their online store! The store is at 1400 Haight St. on the corner of Haight and Masonic and it’s an extremely colorful building so you can’t miss it! I love the tie-dye socks, yoga pants and underware but they also have mens t-shirts, children clothes including baby onsies and even pet clothing that are all tie-dyed! They are support the community in many ways and love giving back so check that out if you get the chance! There is always a great vibe in the store and some great photo opportunities! If you’d like to stay up to date with their new items, Like their Facebook page!